Practice PHP questions and answers for interviews, campus placements, online tests, aptitude tests, quizzes and competitive exams. This set of PHP Multiple Choice Questions & Answers (MCQs) focuses on “Basics of Object-Oriented PHP”. 2. Which of the following term originates from the Greek language that means “having multiple forms,” defines OOP’s ability to redefine, a class’s characteristics? 3. The practice of creating objects based on predefined classes is often referred to as..
4. Which one of the following property scopes is not supported by PHP? Explanation: PHP supports five class property scopes: public, private, protected, final and static. 5. Which one of the following can be used to instantiate an object in PHP assuming class name to be Foo? 6. Which one of the following is the right way to define a constant? 7. Which one of the following is the right way to call a class constant, given that the class is mathFunction? 8. Which one of the following is the right way to invoke a method? 9. Which of the following is/are the right way to declare a method? Explanation: In case of public methods, you can forgo explicitly declaring the scope and just declare the method like you would a function. 10. Which of the following method scopes is/are not supported by PHP? Explanation: PHP supports six method scopes: public, private, final, static, protected and abstract. 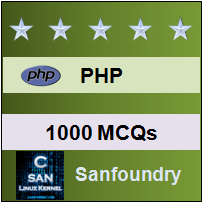 Sanfoundry Global Education & Learning Series – PHP Programming. To practice all questions on PHP Programming, here is complete set of 1000+ Multiple Choice Questions and Answers on PHP.